Fr. Anthony Keane, OSB, Glenstal Abbey and Fr. 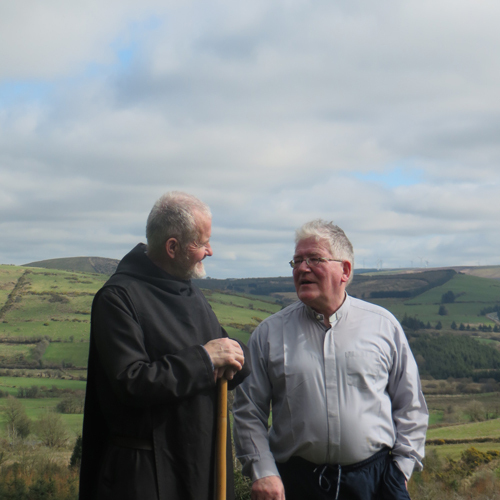 Dan Woods, P.P., Kilcommon Parish, pictured at the Mass Rock field on the Kilcommon Pilgrim Loop Walk, in preparation for National Pilgrim Paths Day 2018. • 1.30-2pm: Registration at Kilcommon Community Hall. • 2.00 pm. Welcome talk by Fr. Dan Woods, P.P. • 3.30: Reflection and Readings at Mass Rock led by Fr. Anthony, OSB. • 4.45: Gathering and Refreshments at Kilcommon Community Hall. All welcome. Strong walking boots and walking sticks recommended.